Renewable Energy are the forms of alternative energy that are being constantly renewed by the natural processes of the Earth, such as the sunlight from the sun or the wind from the air, and are therefore environmentally friendly. Renewable energy has been used as a clean, renewable, and affordable energy source in one way or another for thousands of years. While the world needs to replace fossil fuels with alternatives that are replenishable, all energy resources, even renewable energy sources, are limited. Renewable energy supplies are definitely the direction we want to move towards in the future, but the cost and reliability of renewables will limit how quickly they will grow. Wind and solar photovoltaic power generation have the most potential for growth since the cost of generating green electricity using these devices has decreased a lot in the past couple of decades. However, the variability in weather conditions, geography and energy demand usually means that some type of energy storage is needed to ensure a constant supply. The energies available around the Earth are fed from various sources such as mechanical energy in the form of potential or kinetic energy, the sun’s thermal and solar energy, electric and magnetic energy, nuclear energy and chemical energy. It is these energy forms which we use to generate electricity, operate machinery, drive transportation, as well as to heat or cool a building, and so on. But what is energy?. Energy is power that has the ability to perform work in which work is the application of a force through a distance. Energy comes in many forms and aside from the most obvious, that of physical movement, energy manifests itself in the form of motion, heat, and light. Energy forms using renewable energy technologies are based on the energy forces created by the movement and gravitation pull of planets (oceanic energy, tidal energy), the heating effect of the Earth (wind energy, geothermal) and in particular the energy radiated by the sun (solar radiation, thermal). We may not be able to see energy, but we can see its effects as there are a great variety of renewable energies available to us in terms of energy density and variations in the different forms of energy available. The energy available on Earth that directly or indirectly results from these renewable energy sources can vary tremendously. Practical sources of energy which the world uses as its primary energy supply are called fossil fuels. Fossil fuels typically include coal, oil (petroleum) and natural gas. These fossil energy resources are stocks of energy that have formed during ancient geological times by biological processes and as such fossil fuels are referred to as “nonrenewable energy sources” because, once used, they are gone. So scientists around the world have been exploring the practicality of other energy sources called Renewable Energy Sources. Renewable energy sources include wind, sun, flowing water, biomass and biological processes, and geothermal flows of heat. These renewable energy resources are important in the long term energy planning because as a fuel they can provide energy over a long period of time, produce no waste or pollution and being naturally driven sources are thus regarded as almost “inexhaustible”, well in terms of human time. Energy in its various forms can be broadly classified as either renewable or nonrenewable. Energy sources can be divided into renewable and nonrenewable. Currently nonrenewable energy sources supply the majority of our energy needs due to the ease at which they can be harvested, transported and used. Through the use of technology we have found easier ways to transform their energy content on a large scale to meet consumer needs. Regardless of the source of energy, the energy contained in the source is changed into a more useful form of energy, namely electricity. Natural Gas – natural gas consists mainly of methane. Natural gas is piped into homes and office buildings where it is used as an energy source for heating, cooking, washing, and drying. Natural gases the cleanest burning fossil fuel as it contributes little environmental pollutants when burned. Oil – petroleum or oil is the thick, black liquid pumped from deep below the Earth’s surface. To make oil useful, petroleum oil has to be refined. The refining process separates out the fuel portions used for transportation and products for use in synthetic rubber, detergents, fertilizers, textiles, paints, and pharmaceuticals. Coal – coal is the most abundant fossil fuel in the Earth. Coal is becoming a less widely used energy source due to the cost of mining and its impurities, which causes pollution (acid rain) when burnt and environmental damage from the mining process. Solar – the sun is the primary source of all energy on Earth. Without the sun’s energy, fossil fuels could never have existed. The sun’s energy creates the weather which produces the rains and storms of the water cycle and the uneven heating of the Earth’s surface produces wind energy. Solar energy can be used to cook food, heat water and generate electricity and remains the cleanest renewable energy source on the planet. Wind – the unequal heating of the earth’s surface by the sun produces wind energy. The wind’s energy is converted into mechanical and electrical energy. Today huge wind turbines drive electric generators to turn the wind’s kinetic energy into electrical energy. The wind is a renewable, but unpredictable, energy source. Hydro Energy – when water is collected and stored behind dams on large rivers, it can be used to provide a source of energy for the generation of electricity. The enormous power of falling water is capable of turning giant turbines which drive generators, to produce electricity. The amount of power in the water is determined by the volume of water and the distance it falls. Hydroelectric power plants do not cause pollution, but there are fewer and fewer places to build these large dams. Hydro energy is a renewable energy source. Ocean Tides – the ocean’s tides contain very powerful forces. Tidal power is a form of water power sometimes being called lunar energy as the motion of the tides is affected by the gravitational pull of the Moon. Underwater turbines and tidal barrages are used to harness the energy in the rising and falling of the tides. Tidal energy converts the stored kinetic and potential energy of the oceans water into electricity. Tidal power is clean and renewable, and once an ocean based system is installed, the “fuel” that drives it is free. Geothermal – geothermal energy is the thermal energy stored deep within the Earth that draws heat from the planet’s core. Geothermal sources are the fountains of boiling water and steam known as geysers. Thermal power stations are set up which absorb energy from the planet. The heat from the planet boils a liquid which evaporates to turn turbines, producing the electricity. Geothermal is renewable and does not pollute, however, the locations where geothermal heat is easily available are limited. Geothermal heating is becoming very popular, and is a cost-effective alternative to oil or gas home heating. Biomass – biomass is any kind of organic biological matter that can be converted into energy. The transformation of plant or dead vegetable matter, from either crops or forest waste, organic wastes (mainly manure), and food wastes which would otherwise end up as landfill, into electricity is an exciting area that has a great deal of potential to produce energy from previously untapped sources without polluting the environment. A subsection of biomass is biogas, methane gas produced from biological sources. 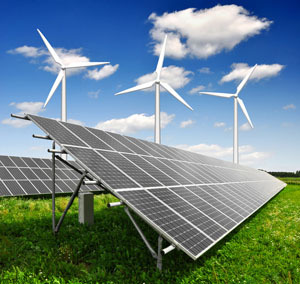 Renewable energy uses energy sources that are continually replenished by nature. These sources include the sun, the wind, water, the Earth’s heat, and the gravitational pull of the plants. Long before the industrial revolution started, renewable energy sources provided virtually the entire global energy supply. Today renewable energy technologies turn these natural sources into usable forms of energy. The most common being electricity, but also heat, chemicals, or mechanical power. Renewable energy is everywhere often in predictable amounts in all parts of the world and being renewable are replenished day after day, year after year by the natural processes of the Earth, such as sunlight from the sun or wind from the air, and so are environmentally friendly. Renewable energy sources are also fairly reliable resources too, making them a sustainable energy source that we can rely on as their supply is not finite like coal, oil, natural gas, and nuclear. Then we can see that these Renewable Energy Sources could provide mankind with an enormous and sustainable free and green energy supply, if we’re smart enough to tap into it. To learn more about “Renewable Energy”, or obtain more renewable energy facts and information about the various renewable and nonrenewable energy sources available, or to explore the advantages and disadvantages of renewable energy, then Click Here to get your copy of one of the top books available from Amazon today about powering your sustainable future. I am Eloise from DLi battery, we are LiFePo4 battery manufacture. Aluminum alloy: 3.2V 5AH, 3.2V 10AH, 3.2V 20AH, 3.2V 25AH, 3.2V 60AH and 3.2V 70AH. And also some lithium ion cells(18650, 26650, 32650 etc.) for E scooters , bikes , small small system s etc . Our battery are widely used on : Electric vehicles, golf carts, boats, off-grid system, UPS, Streetlight , Energy storage system and so on . I didn’t know that natural gas was a renewable energy. Making sure you have the best energy possible seems like it could be important. Hopefully, people look into finding the right company for them. Super information. Guides about all the types of energy and how one can utilize the natural ones. The renewable or recycled energies are the saviors of the environment. Thank you so much for sharing the great information about all energy resources and the process how they could be used. Renewable energy sources includes the natural sources such as sunlight, wind, rain, tides, geothermal heat, biomass sources such as energy crops. Fuels such as coal, oil and natural gas are non-renewable sources of energy. Bio gas from starch waste and farmyard waste for agricultural and dairy farms and LNG, bio-diesel and landfill gas for industrial purpose are viable alternative sources of energy.